Missouri River Country is home to sweeping vistas and stunning sunsets, but this gorgeous landscape is also home to many iconic North American animals. Roll the windows down and take in the fresh air as you explore this wide-open terrain on our top 5 wildlife tours. Be sure to stay on designated roads and have your cameras ready to capture Montana made memories. Many amazing Montana critters call Medicine Lake Wildlife Refuge home, including geese, grouse, owls, jackrabbits, beavers, muskrats, deer and more. The Medicine Lake loop travels throughout the complex and around the lake. Road conditions may vary throughout the year, especially in the early spring or late fall, when roads may be wet from snow. A 4-wheel drive vehicle is recommended for the entire loop, though portions can be done without. Bowdoin is a prime example of the native grasslands dominant in eastern Montana. It serves as an important habitat for breeding and migratory birds, as well as home to many threatened and endangered species. Mammals such as mule deer, white tail deer, pronghorn, and fox call Bowdoin Home. Check driving conditions before heading out on dirt roads, and take caution. Heed warnings for 4-wheel drive roads. 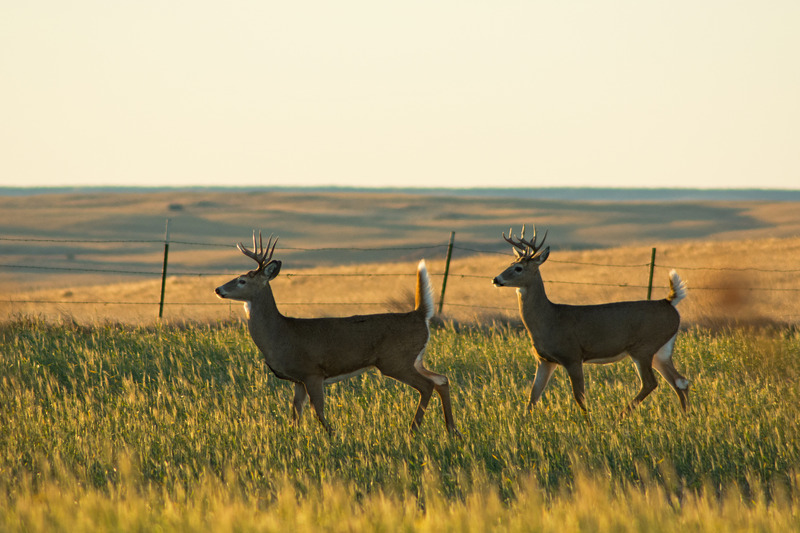 Right outside of Fort Peck lies the 230 acre Leo B. Coleman Wildlife Pasture. View bison here and take advantage of the various pull-outs from the road to observe these spectacular creatures. Once native to Eastern Montana, the bison can only be found in small habitats through Montana, Wyoming, and Idaho, including outside of Glacier National Park, in Yellowstone National Park, at the National Bison Range, and in Missouri River Country, here at Leo B. Coleman as well as on tribal land on the Fort Peck Indian Reservation. Take Big Horn Street on the west side of Fort Peck to access the pasture. In the fall, Slippery Ann Elk Viewing Area is the best spot to watch (and hear!) elks bugling during the rut. Access is easy and accessible for all car types. Bring a spotting scope or binoculars, and plan to stay a while—once you see and hear these majestic creatures, you won't want to leave any time soon. The Charles M. Russell National Wildlife Refuge is a 1.1 million acre tract of land that spans along the western Missouri River and includes UL Bend National Wildlife Refuge. View the gorgeous landscapes as Lewis and Clark would have seen them. Take in the cottonwood river bottoms, badland formations, sagebrush expanses and prairie-lands that make up this extraordinary refuge. Hundreds of mammals, fish, reptiles, butterflies, and birds call this place home, and with an impressive road system throughout, the sky is the limit for exploration. Certain roads close in winter time or when the roads are too wet from rain, so check for updates before heading out.